Post: Water Leaks – Sound Familiar? After a good wind-driven rain, without fail the AAA-1 Masonry & Tuckpointing switchboard lights up with calls from condominium owners experiencing water leaks. Over 95% of the time, those leaks occur over a unit owner's rear bedroom balcony door or transom in a newer condominium building constructed within the last 15 years. Usually, owners first become aware of the problem because water has pooled on the floor or, worse, has warped or buckled the floor boards. Sometimes the leaks are so severe that owners observe a steady stream of water flowing out of the wall above their door frames or transoms during a storm. In the photo at right, we have removed the damaged drywall to reveal a very wet concrete block wall with no insulation and an improperly constructed wood stud wall. In the last 15 years or so, the use of high-quality brick has been replaced with larger, less dense and far more porous concrete blocks (aka Split Face Blocks). Developers like using these larger building materials because they drastically reduce the time required to construct a building's envelope. Depending on the depth of the block used, a single concrete block can replace the need to use up to 20 bricks. One concrete block versus 20 bricks?!? If you're a developer, the cost-saving choice is obvious. Usually developers will face the front of a building with more expensive and much denser brick in order to improve the building's curb appeal (any wonder, then, reports of water leaks in newer buildings are rarely reported on the front facade). 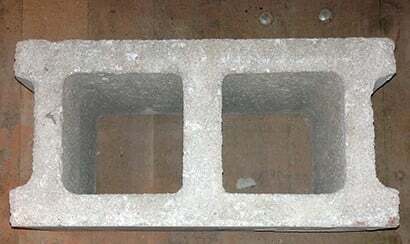 Not only is the density of the material used in concrete blocks far less than the density of the material used in traditional bricks, but concrete blocks are mostly hollow! (Refer to photo above right.) 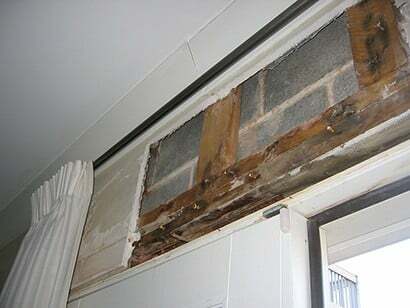 In general, wind-driven rain more easily passes through the walls of concrete blocks and therefore increases the likelihood of wet insulation, water stains, electrical shorts and damaged floors. That's bad! Due to their porosity, concrete blocks need to be sealed. Sealants usually come in liquid form and are sprayed onto a wall. (Avoid applying sealants with a roller as this method does not effectively reach every nook and cranny of the block.) The type of sealant used and how much is applied makes a huge difference in its effectiveness and longevity. I will explain the differences between the many masonry sealants available in a future blog post, but know this: concrete blocks are not manufactured at the plant with sealant already in them. That's an urban myth — one that has been perpetuated by misguided real estate professionals and developers for nearly two decades. Due to the severity of Chicagoland's wind-driven wet weather events, concrete block walls must be sealed (after they are constructed), and this includes walls constructed with oversized utility bricks (which are nothing more than concrete blocks shaped to resemble bricks). Flashing is a water-proof material used to direct water out of a wall. When properly installed, the flashing works as a barrier to prevent water from infiltrating the wall cavity and damaging your living space. When we do find flashing installed in concrete block walls, it is usually installed improperly or it is incomplete (e.g., the builder decided to install only 25 linear feet of flashing in a 50'-long wall). Well-intentioned developers are insisting their builders construct walls with the proper through-wall flashing detail over all window and door openings. Unfortunately, not all well-intentioned developers recognize a properly-installed flashing detail. Very often there is deck or balcony one floor above the unit where the leak is observed. Look carefully and you will see that the deck or balcony is secured to the concrete block wall using through-wall fasteners called carriage bolts. Wherever you see a carriage bolt, water has the ability to infiltrate the concrete block wall and drip into the hollow wall cavity. Because most decks and balconies are built right up against the face of the building, it can be hard to see the water flowing down the carriage bolts and into the hollow concrete block wall…but it is happening! What can you do to protect yourself from water damaging your home or investment? The material should carry a written warranty and be applied when the masonry wall is bone dry. The sealant should have a moisture transmissivity rate >99%, which means the sealant allows the masonry wall to breathe while at the same time providing a hydrophobic barrier against wind-driven rain. We are very qualified to determine whether your walls are properly sealed. We have applied millions of gallons of the highest-quality silane sealants to some of the finest masonry structures in the Chicagoland area. We know what works and the pitfalls to avoid if your building has been sealed in the past by a handyman or someone less qualified. Click here to request a free inspection of your walls. From everyone at AAA-1 Masonry & Tuckpointing, thank you for your loyalty and trust.